Formed by combining Might and Magic: Clouds of Xeen and Might and Magic: Darkside of Xeen (see instructions). Later CD-ROM versions have full speech for all dialogue. CD-ROM versions have full speech. Use DOSBox. Includes both speech and text versions. Bundled with games 1-6. Pre-packaged with DOSBox. Might and Magic: Clouds of Xeen and Might and Magic: Darkside of Xeen can be combined to form World of Xeen. Later compilations have the games already combined (the title screen will say World of Xeen). If neither game is installed, run the Darkside installer and insert the Clouds disks when prompted. If only Clouds is installed, install Darkside into the same folder. If only Darkside is installed, run the Darkside installer again and insert the Clouds disks when prompted. If both games are already installed separately, move XEEN.CC and your saves into Darkside's folder. Run the game from the new combined folder by typing XEEN. 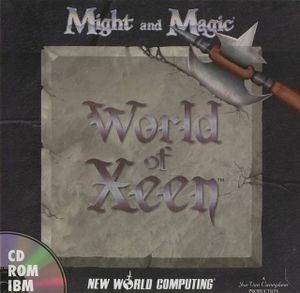 World of Xeen normally uses the Might and Magic: Clouds of Xeen starting location. This does not work for the full speech version. Run the game. You will see the Might and Magic: Darkside of Xeen title screen. Make a new save and start the game, then save and quit. You can now start playing World of Xeen in Darkside from that save. Speech version saves are *.WOX instead of *.SAV. Off by default; for cutscene subtitles disable speech in the installer.